While reviewing first posts I noticed that I am shown new posts with all the tags. A few minutes ago I got this post for review, it's a question regarding the r programming language, of which I have no knowledge. But as it looks, I can feel that the question is not properly formatted (it looks like there are some code lines not formatted as code). But I can not edit that without knowing properly, so I skipped. This happens often. Some posts popup with tags which I don't have much knowledge of, so I skip. What if we could choose some specific tags of which we have knowledge to understand the problems and mistakes to edit, or comment on, or even to decide No action needed? Stack Overflow already has lists of the user's favourite and ignored tags, so I think it's much better if the review queue is filtered using those. 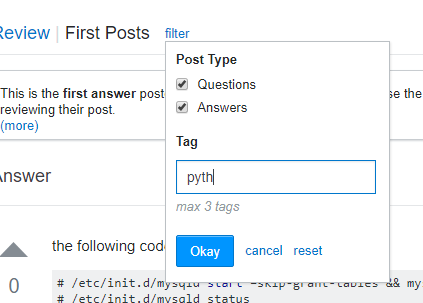 Browse other questions tagged feature-request tags review first-post-review . Establish a two stage question commit process? What to do with code-only answers in Low Quality Posts queue? What is the best Triage response for give me teh codez questions? Possible bot idea: Should 1-off bad reviews in First Post/Late Post queue be reported?